Item # 317054 Stash Points: 1,195 (?) This is the number of points you get in The Zumiez Stash for purchasing this item. Stash points are redeemable for exclusive rewards only available to Zumiez Stash members. To redeem your points check out the rewards catalog on thestash.zumiez.com. 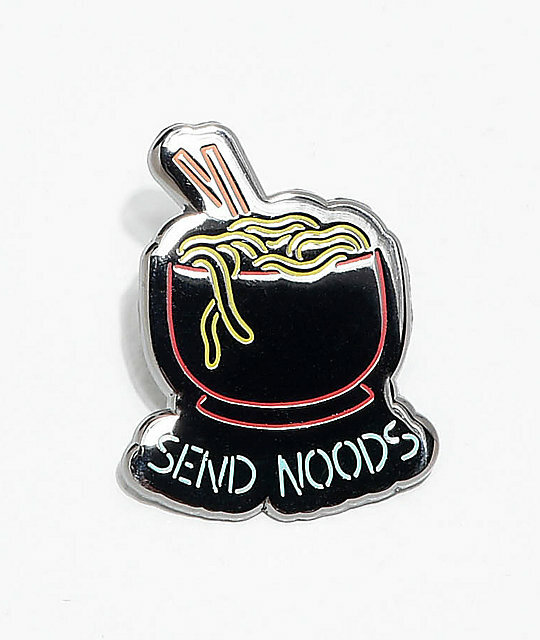 Humorous and lighthearted, Stickie Bandits presents their Noodles Enamel Pin. Perfect for adding a touch of flair to any of your canvas or denim jackets, this accessory features a graphic of a bowl of noodles accompanied by the text "Send Noods." Noodles Enamel Pin from Stickie Bandits. Bowl of noodles and text graphic. 0.75" , 1.25" | 2 cm, 3 cm.